Written by sayoni on 31 May 2011 . Posted in Events. In exactly one month, on 18 June 2011, Singaporeans will, for the third year running, gather at Hong Lim Park to form a human pink dot in support of the belief that everyone deserves the freedom to love. Organised by a pool of Singaporean volunteers, Pink Dot campaigns for diversity, inclusiveness, and works to foster understanding for the basic human need to love and be loved, regardless of oneʼs sexual orientation. 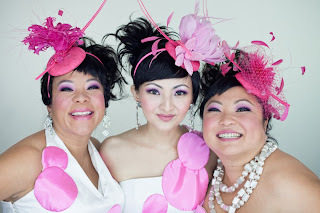 This year, Pink Dot 2011 is fronted by the DIM SUM DOLLIES (picture below), the comedy trio comprising Emma Yong, Pam Oei and Selena Tan. Festivities begin at 4.30pm with a dynamic line-up including performances by Dave Tan of local indie band Electrico, Broadway Beng Sebastian Tan and dance group Voguelicious. A campaign video, conceptualised and directed by award-winning filmmaker Boo Junfeng (Sandcastle, Cannes 2010), can be seen here: http://youtu.be/FrIB5Ojbqns. Already, the video has garnered more than 34,000 views within 36 hours of its May 17 launch. Boo, 28, said: "The social stigma that LGBT people carry is often overlooked when we talk about homosexuality. The freedom to love and the comfort of being yourself, things many LGBT people hope to have, are often taken for granted by straight people. Beyond the event on June 18, I hope the video will continue to empower and inspire empathy for LGBT people". Pink Dot spokesperson Paerin Choa said: "We believe that Pink Dot 2011 will take another step towards a more inclusive and cohesive Singapore. Past events have seen people from different walks of life come together for this event – young, old, straight, gay, families and friends. It is extremely heartwarming to know that Singaporeans believe in building a more tolerant and harmonious society." *Please note: According to the park's terms and conditions, only Singaporeans and Permanent Residents may participate at the events held at Hong Lim Park. However, foreigners are most welcome to watch and observe. Pink Dot 2011 is just 2 weeks away. Thank you for supporting our campaign video. It has gone viral worldwide and chalked up almost 180,000 views barely 2 weeks after its release. The Pink Dot organising committee. will over all WordPress is just so great. Countdown: 6 days to Pink Dot 2011 (Saturday, 18th June)! Pink Dot 2011 will be happening this coming Saturday at 5 pm. We have a brand-new programme lined up for you - a musical concert featuring the Dim Sum Dollies, Dave Tan (Electrico), Michaela Therese, Sebastian Tan as Broadway Beng, OMG winner Jill Marie Thomas, Rima S and the ever-luscious Voguelicious! The major LGBT organisations in Singapore will also be on hand to show everyone what they have to offer. Even if you don't have a single article of pink clothing in your wardrobe, come down to Hong Lim Park anyway. We have loads of pink accessories to be given out with which you can pinkify yourself. However, we request that you do a bit of homework. We are going to sing The Beatles' hit, "I want to hold your hand" at the finale, so you need to learn how to sing it. Tomorrow, Saturday, 18th June, is Pink Dot day! Our concert will start at 5 p.m. sharp, but you may want to come a bit earlier, say, at 4:30 p.m., to visit the LGBT organisation "booths" or snap photos with our roving performers. This is a RAIN OR SHINE EVENT. So, if you have a pink umbrella at home, do bring it along. If not, we have some to give away but supplies are limited. The lyrics are in the video description section just below the video. To celebrate the Freedom to Love at PinkDot's event, YOH will be having a booth in Hong Lim Park. YOH volunteers will be on hand to talk to you about us and what our programmes are. You can also sign up to be informed of the next YOH's Support Group or any other YOH event, or be part of the exciting group of YOH's volunteers. See you at our booth at PinkDot! Thank you for making Pink Dot 2011! We would sincerely like to thank everyone who turned up at Hong Lim Park on Saturday to support the freedom to love.